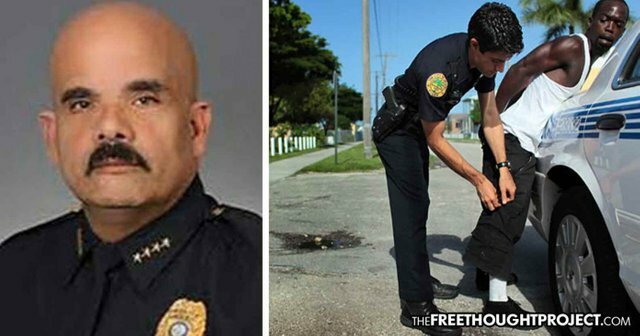 A scathing report from the Miami Herald details that on multiple occasions, former chief Atesiano told his cops to target random black people and charge them with crimes in open cases so they could boast their clearance rate — which is defined as the amount of open cases solved by the department. According to the Miami Herald, Atesiano, 52, pleaded guilty to a conspiracy charge of depriving the three suspects of their civil rights because he and the officers framed them. On top of framing innocent black teenagers for dozens of crimes they never committed, the department was a place where cops openly drank on duty, practiced shady financial schemes, and had no problem bragging about their racism and sexism. Investigations revealed that the second in command, Capt. Lawrence Churchman, routinely spouted racist and sexist insults and suffered no recourse. “The captain has said on several different occasions he doesn’t want any n—–s, f—–s or women b—–s working at Biscayne Park,” officer Thomas Harrison said according to the report. During the years the cops were framing innocent black people for crimes of which they had no evidence, the clearance rate for the department was nearly perfect. In June, the village hired as its top cop Luis Cabrera, a former high-ranking Miami police officer. He says he’s audited the evidence room, restructured the command staff and is getting civil-rights training for officers. Cabrera made Wollschlager his second-in-command, despite being entangled in the 2014 internal investigation. The investigation concluded Wollschlager drank on duty and ordered suspect burglary arrests. But the department’s new chief reversed course and cleared Wollschlager. He left the Biscayne Park force this spring for a command post in North Bay Village, but was soon let go after news broke about the indictment of Atesiano and the other officers. Cabrera said he decided to rehire Wollschlager in June. He deserves to rot in prison, and then hell. We really don’t need police, that’s the truth. We are all good at heart we just need to learn how to use it. Are you telling me a Florida Man did all this? When Hispanics are racist cops then they are white for the purposes of race baiting articles.